We’ve got something a little different on the review floor this time, we’re taking a look at Miposaur. An electronic dinosaur toy that’s controlled via hand gestures, app or accompanying trackball. This is a top quality gadget suitable for kids and even bigger kids like us dads. WowWee have built a solid, fun and you could say highly interactive robot pet. I love it! The kids point and shout at the television when we recently saw an advert. 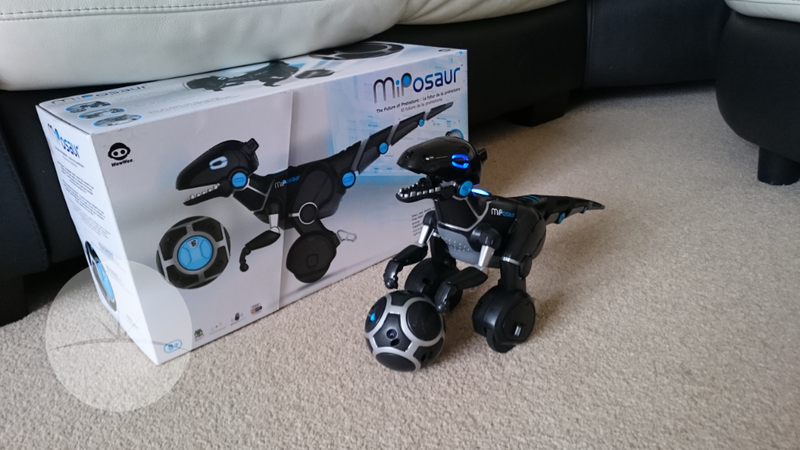 Miposaur is a new generation of Bluetooth controlled toys! Be warned! It can be a little grumpy some times! Setting up couldn’t be simpler! To get started, you’ll need 8 AA batteries. 4 for the bot and 4 for the trackball, these are not included in the packaging. Flip the switch and off the Miposaur goes. After wrestling the beast out of the box, you’ll notice straight away this is a premium robot. Solid, a little bit of weight and great plastic high gloss finish. What good is a £90 robot that smashes on the first day the kids get it? The Miposaur could hit the kitchen floor a hundred times and still work perfectly, I’ve faith in the build quality, finish and construction to make such a bold claim. The little wheels and moving parts are well fitted as they have to be to pass safety regulations. Miposaur responds to 10 basic commands, and will react differently to each of them depending on his mood. Swipe, spin, one hand, two hand, pull his tail, give him a push, clap your hands etc etc. What I found is he often responded differently to a command, this gives the more interaction feeling of the bot is alive. 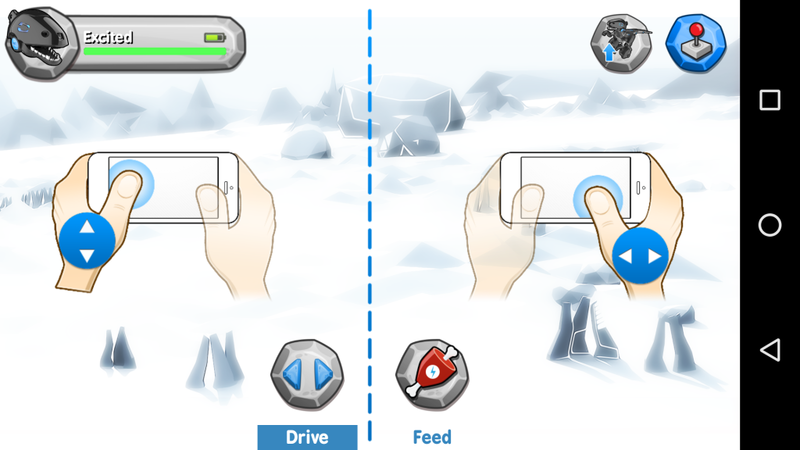 The TrackBall comes loaded with 6 different game modes: Leash, Ball, Food, Teddy Bear, Dance, and BeatBox, and each game mode is represented by a different color. 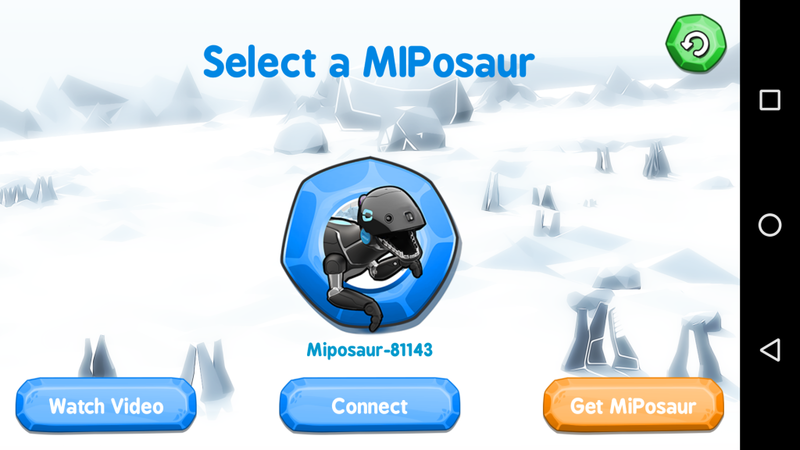 Watch, play and interact with Miposaur doing tricks, kind of like your pet dog does. Kind of. 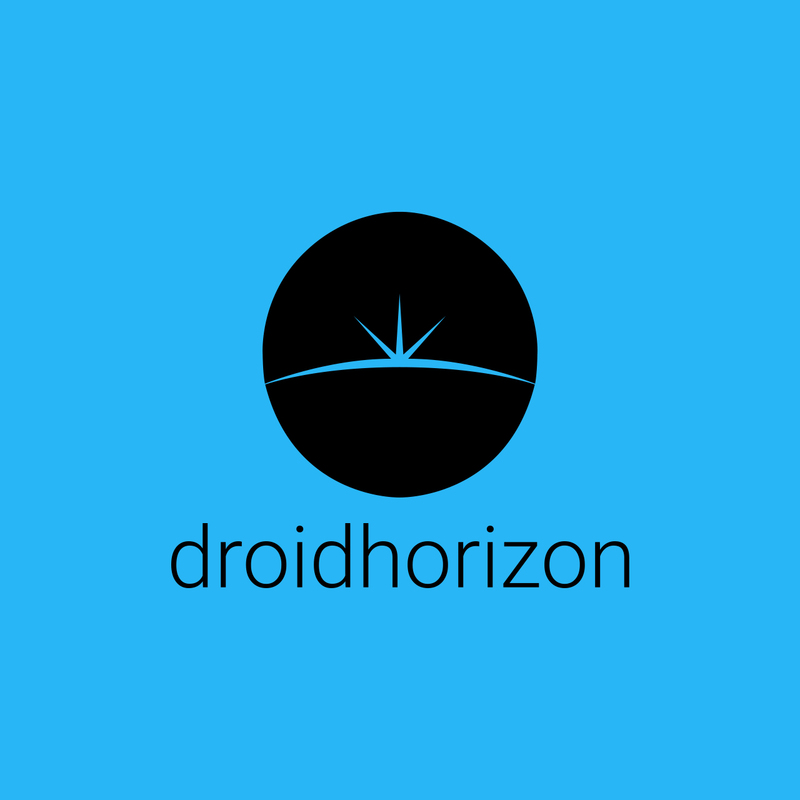 Using the free app from the Play Store you can steer, train and play games with the bot. Once you download the app you may get a firmware update like we did in testing. The steering is just forward and back, then left and right. The Miposaur was surprisingly quick and the range was further than my livingroom floor anyway. We didn’t take it outside. The robot pet has certainly come along way. Every eight year old has a smartphone now with Bluetooth to control the Miposaur with. Great fun for all ages too, set the bot down and show your grandmother some silly tricks your new pet does. Ask her to pull it’s tail, he might be grumpy and snap at her hand, that would be absolutely hilarious. I’m not sure if the kids would still be playing with the bot in 3 months but most kids won’t play with the same toys for a more than a few weeks now anyway. If you have the previous robot version or another Miposaur you can get them to fight to the death, ok, maybe we exaggerated a little here. Watching your new pet dance will probably be most people’s favourite move and it’s party piece to show off. Evolving intelligence for progressive play. Use the trackball to activate modes such as dance, feed or chase. Direct drive control Miposaurs movements. Compatibility: Fully compatible with other Miposaur and Mip and with Bluetooth low energy (BLE) 4.0 enabled devices. Please ensure your phone/tablet is updated with the latest software (Device and software not included). Dimensions: 36L x 14.5W x 23H cm. Running Time: Approximately 5 hours. So, would I recommend to buy the Miposaur? Sure why not! Christmas is just around the corner and this little bot would be loved by loads of kids. Ok, it’s not cheap but actually cheaper than what the original recommended retail price at launch was. Shop around a bit and you may even find a cheaper price on Argos if you’re in the UK. 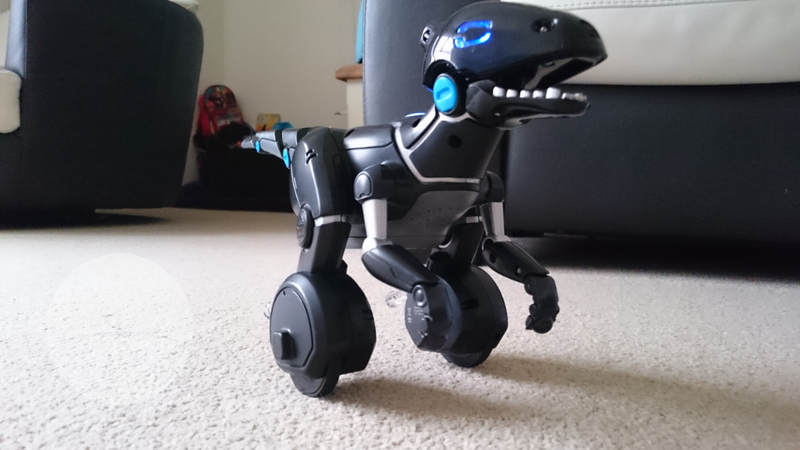 This little dino bot is packed with tech, Bluetooth, sensors and who knows what else. Pity WooWee didn’t think of designing something with a larger capacity fixed battery that could be charged via micro USB. Did I type Dino Bot? Imagine this was Grimlock from Transformers? They could charge double the price and probably would if Hasbro was involved.